In recent years there has been a growing interest among nationalist art historians on the topic ‘the western view of Indian art and culture’. 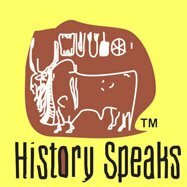 There is no doubt that the Europeans were credited for introducing Indian history as a case of scientific enquiry, yet some of the early travelers had viewed Indian gods as ‘monsters and devils’. Why and how? From the earliest date the Christian Church had taught all Pagan religions were invented by the devil. Originally this attitude had grown up in connection with classical gods. As a result of this belief demons instead of idols had been frequently shown standing on antique columns. Many of the fathers had agreed not only that the Pagan gods were demons, but these demons were the forces still alive and active in the Christian sublunary world, that attacked souls and tempted them. In early Christian iconography the devil commonly appeared as a serpent or a beautiful man. 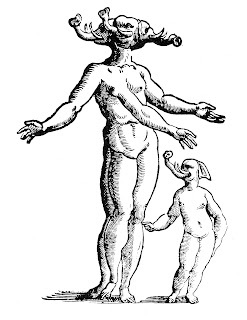 It was around 1000 AD, hideous and frightening characteristics of the devil began to take shape. 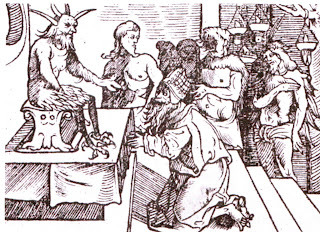 Since Pagan gods had already been reduced to the levels of evil spirits, there was nothing to prevent artists from borrowing some of their features in order to create a more convincing image of the devil, such as goat-beard, cloven hooves, and shaggy lower limbs. 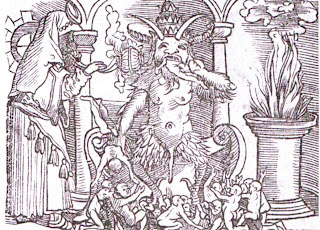 Although the early Church tradition had interpreted these images as a human agent of the devil and the devil himself, in popular imagination in the middle ages the Church views had been considerable ignored. 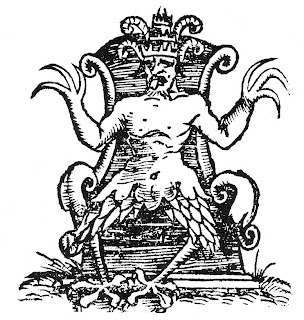 Thus, by the late medieval period an elaborate and in many ways frightening imagery of demons and hell had grown up, consisting of elements from diverse sources, including the classical monsters and gods, Biblical demons and Indian Gods. Against this tradition and beliefs some of the early travelers from Europe had put forth their perspective on Indian gods as devils and monsters. Ludovico di Varthema was an Italian traveler to South India during 1503-08. 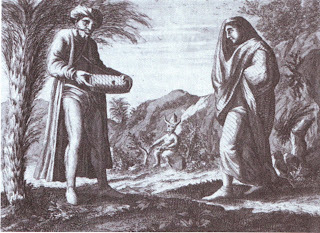 Varthema’s description on Calicut was that, while the King ultimately believed in God, the ruler paid respect to the devil, known as Deumo in these parts. With the publication of Varthema’s report the western images of Indian gods received an entirely new and sharp definition. 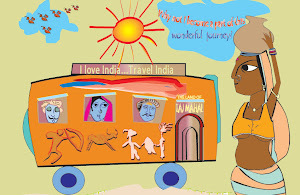 The 16th century witnessed a sudden increase in Indian travels as well as the publication of travel reports. Varthema’s report affected both literature and the pictorial tradition relating to Indian Gods. Five years later in Germany an illustrated version of Varthema was put out. In the matter of popular prints on topical subjects or illustrations accompanying travel reports the Germans were the undoubted leaders in the 16th century. The publishers, moreover, had the services of outstanding artists. For his illustration of the idol of Calicut, the Augsburg artist Jorg Breu turned to a stereo type that closely corresponded to the description in Vathema, since he did not have access to an actual Indian image. His task was made very simple by Varthema’s substitution of a European devil for an Indian God. Dutifully he produced a wood cut which was no different from the popular wood cuts of the devil. The Deumo of Varthema set the tradition of demons in India in literary accounts and in illustrations. His particular portrait of Indian gods thus made its way into the works of subsequent travelers, most of whom were either directly or indirectly indebted to him. While the picture of anti Christian demons posing Indian gods continued to haunt the pages of travelers, each traveler began to enrich the tradition by adding elements from his own experience in India as well as from his knowledge of the medieval demonological iconography. From the end of the 16th century to the beginning of 17th century the group of British arrived in India. Some of them have left us their impression of Hindu gods. The learned priest Edward Terry came to India as a chaplain to Sir Thomas Roe. Terry pointed out that the notorious idolaters, the Hindus, were divided into many sects. He also agreed with the prevailing view that Hindu images of worship were made in monstrous shapes. J.H. Van Linschoten arrived in India in 1853 and lived there for five years. His report on Salsette (in west coast of India near Mumbai) says: “The pagodas and images are many and innumerable throughout the Orientall Countries…By the town of Bassayam…there lyeth an island called Salsette. There are two of the most renowned pagodas, or temples, or rather holes wherein the pagodas stand in all India…Images therein cut out of the (very) rockes of the same hill, with most horrible and fearful (forms and) shapes…all the chambers…are all full of carved pagodas, of so fearful, horrible and devlish forms that it is (an abomination to see). Linschoten came across another monstrous Indian god in a village in the south was ‘so misshaped and deformed, that more monstrous was never seene, for it had many hornes, and long teeth that hung out of his mouth down to the knees, and beneath his navel and belly it had an another such like face, with many horns and tuskes…upon the head there of stoode a (triple crown) Myter, not much unlike the Popes triple crown, so that in effect it semed (to be like the monsters described) in the ‘Apocalips’. Three Frenchmen who visited India in the second half of the 17th century achieved great fame in contemporary Europe. The jeweler, Jean Batiste Tavernier, who made six voyages to the East, had met the other two Frenchmen, Thevenot and Bernier. Tavernier gave a detailed description of Puri, Benaras and Matura, three of the greatest Indian temples in his book dated 1676. In the Jagannath temple in Puri he found ‘Niches filled with…idols; the greatest part whereof represent most hideous monsters, being all of different colours.” Similarly he found in Mathura ‘Round of Dumo’s (dome) are niches filled with the figures of demons…Some with four arms, some with four legs, some with men’s heads upon bodies of Beasts, and long tails that hang down to their thighs: There are an abundance of Apes; and indeed it is an ugly sight to behold so many deformed spectacles’.